• Introduction. 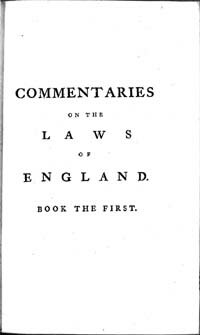 Of the Study, Nature, and Extent of the Laws of England. - Sect. I. On the Study of the Law. - Sect. II. Of the Nature of the Laws in general. - Sect. III. Of the Laws of England. - Sect. IV. Of the Countries subject to the Laws of England. • Book I. Of the Rights of Persons. - Chap. I. Of the Absolute Rights of Individuals. - Chap. II. Of the Parliament. - Chap. III. Of the King, and his Title. - Chap. IV. Of the King's Royal Family. - Chap. V. Of the Councils belonging to the King. - Chap. VI. Of the King's Duties. - Chap. VII. Of the King's Prerrogatives. - Chap. VIII. Of the King's Revenue. - Chap. IX. Of subordinate Magistrates. - Chap. X. Of the people, whether Aliens, Denizens, or Natives. - Chap. XI. Of the Clergy. - Chap. XII. Of the Civil State. - Chap. XIII. Of the Military and Maritime States. - Chap. XIV. Of Master and Servant. - Chap. XV. Of Husband and Wife. - Chap. XVI. Of Parent and Child. - Chap. XVII. Of Guardian and Ward. - Chap. XVIII. Of Corporations.